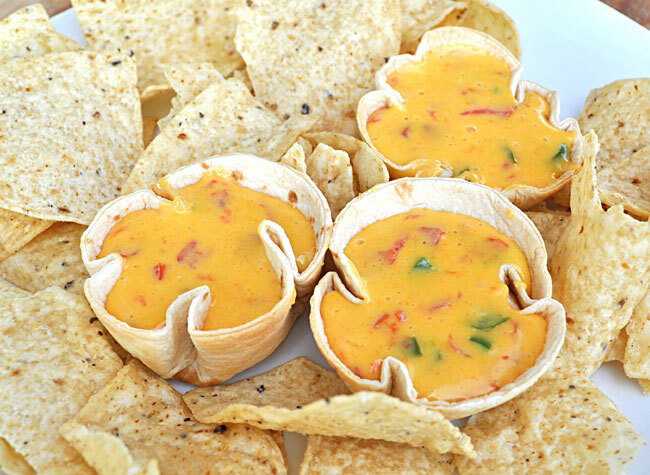 I’m breaking out the Velveeta for queso cups, so if you’re a cheese “aficionado,” read no further. It’s a classic recipe, but taken down to individual serving sizes in baked tortilla cups. When you’ve dipped out all the cheese, just eat the container! They’re great little single-portion appetizers when you want to do something a little different, but still want to serve comfort food. Microwave 3-4 rounds at a time wrapped in a damp paper towel (about 30 seconds) to soften. Mold the cups into a lightly greased muffin tin. Bake at 350 degrees F for 9-10 minutes. 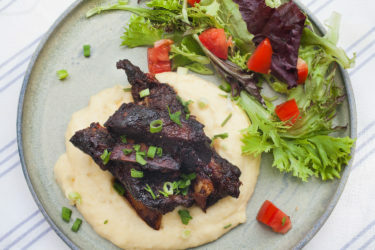 This is a classic recipe that’s so much better using fresh ingredients. You can use the canned variety (tomatoes and peppers) as well. Just pile everything into a large bowl. Microwave on medium for about five minutes, stir, then another five minutes or so as needed. 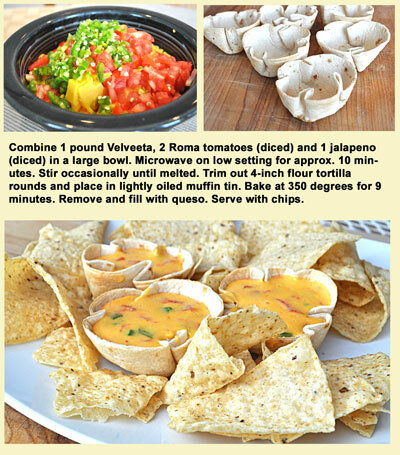 Fill the flour tortilla cups and serve with chips. You can also reheat them after they’ve been filled, if the queso thickens too much. Microwaving will soften the baked flour tortillas somewhat; a low oven is better. Make plenty, because the baked flour cups will disappear in a hurry!